Known as Gwendolyn Mendoza by the Government, Celeste Joined RCRD’s training program this past year. From humble beginnings with RCRD, to passing assessments just in time for an Internship and Jamming for the Black Diamond Rollers’ Dolls of Destruction, this skater is ready to lace up wearing the black and green come 2018.You won’t miss #206 as this agile Jammer flies around the track! Outside of the derby-verse, Celeste goes to school full time pursuing a degree in Management Information Systems and works as a cook, with over a decade of experience after her FIRST degree, while she works towards the next milestones in her life. If two full time responsibilities aren’t enough, she also does freelance photography and editing work for larger companies when needed. Celeste has such a unique and well defined list of hobbies and interests. There’s nothing this girl won’t do or try at least once. She’s a certified blade smith, hand forging traditional layered kitchen knives, a talented fashion nerd, and has even started and continues to develop the library makerspace and STEM programs for most of Southern NY. “So, about nine years ago, my wife at the time went to a bout in Minneapolis where we were living at the time. She loved it and it sounded so cool! A few months later we ran into the team she had seen at a booth while shopping one day. They were the Minnesota Rollergirls and they were SO FREAKING COOL, I went home and looked up roller derby and wanted to be a part of it so badly that my heart hurt. I made myself forget about it, I knew I wanted to be a skater but at the time the entire world, including myself, were convinced I was a guy. Years later I was doing work-study for a library system in NY’s southern tier and learned one of the librarians skated. I asked her millions of questions for months and helped promote her league based in Elmira, NY. 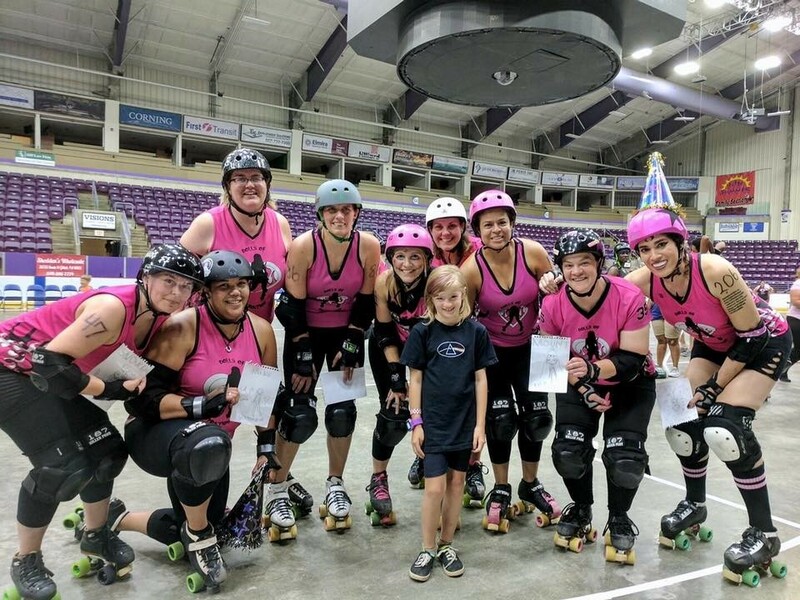 It is without question that this skater will continue to shine bright as she learns and grows in the roller derby community. And we cannot express our gratitude enough to have had her join our Roc City family.